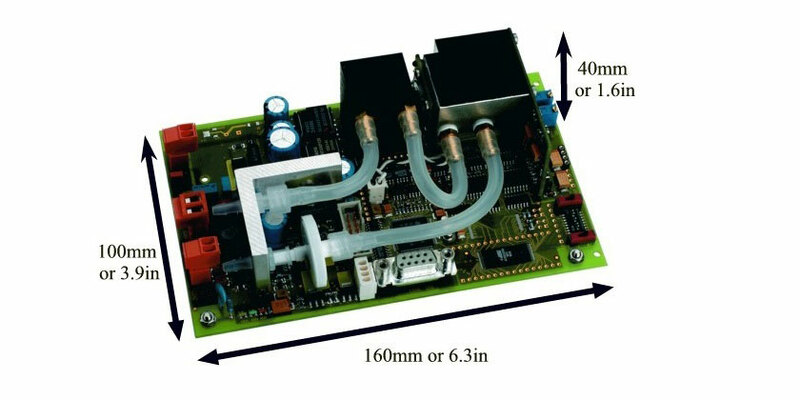 The CarbonOxy is a unique device for measuring CO2 and O2 on a Euro Printed Circuit Board (PCB). Carbon Dioxide is measured using the dual wavelength technique (NDIR - Non-Dispersive Infra Red) while Oxygen is measured using Zirconium Oxide. This combination ensures a quick response time along with elimination of interference from other gases. With various DIP switches on the circuit board, the response time for the analyzer can be adjusted between 1 to 10 seconds. It is possible to do automatic temperature correction or zero point adjustment can be made. The entire circuit board is constantly monitored by a microcontroller and LEDs in various colors can indicate alarm states and out of range values. The power consumption of the combination is maximum of 6 watts and hence is suitable for a portable, compact measuring device. All electronics meet the latest European EMV regulations.